This entry was posted in Equations by I Speak Math. Bookmark the permalink. I love the Monsters idea! That’s awesome! I love this! 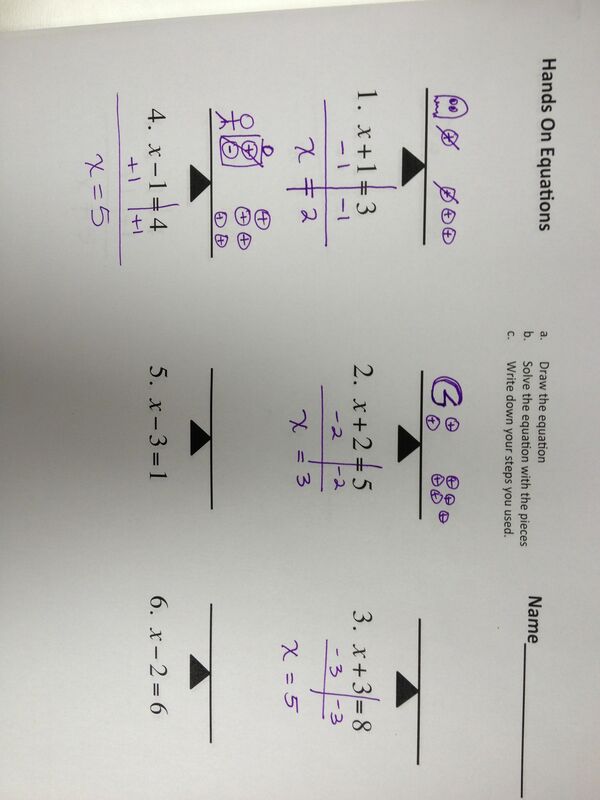 I spent most of the day trying to figure out how to help my 6s with equations! Today we made a flipchart focusing on the basic steps, and they practiced tonight. This will be perfect. I love “just in time” learning:) Yay- thanks!! Very cool idea. I like the balance metaphor. I’ve seen others do something similar, but the “monster” would chase away the integers, and when crossing over to the other side, their signs would change. I was never a fan of that method – it doesn’t translate well into mathematical thinking. But I still like the metaphor. I wonder if there is a good mathematical explanation of how the monster could chase the integers away. FYI, when your posts show up in my google reader, they’re usually the first ones I read. Thanks! Monster math…another idea I will shamelessly rip off from you. Maybe you should just come teach my classes? Thanks! Giving this a shot right after MEAPS! Can’t wait to get to real teaching and learning! Love this–very intuitive, and moves students up the ladder of abstraction nicely. How did you do the monsters with multiplying and dividing–and could you share some examples of that? Or did you just go straight algebra at that point? Thanks! For 2x = 4 I said if two monsters ate 4 integers, how many integers did each monster eat? For x/2=3, I said if half a monster can eat 3 people, how many people could a whole monster eat? We drew half a monster. Sometimes I say people instead of integers to make them laugh. 🙂 and I also bought a monster hat and hands to wear for fun. They loved it! This is a great idea! I am looking forward to trying it out with my class tomorrow! Awesome! It’s so fun. I had a student even bring me little monsters that she made with wiggly eyes! This worked out well! Prior to starting, I gave my students a very brief intro to integers, particularly that opposite integers have a value of zero. Then I introduced the class to the monsters. It was love at first sight! After modeling and some guided instruction, the class worked on a handout. Today, I sat my entire class in the hall and had them pass the equations. It took some time to get into the rhythm, but it worked out great. I love that it provided the students time to discuss the equations and their solutions, particularly if a student arrived at an incorrect answer. Thanks! How did you explain adding a positive integer circle for every negative integer circle (like in problem 4 on the first worksheet)? There are all the typical ways of doing so, but I’m wondering how you tied it into the story of monsters eating them. Thanks for the great idea! Hoping my small group will understand this concept better than what they got in class. I like to use math vocabulary so I would just say, “How can we get rid of a negative one?” And then tell them to use the inverse operation to make a zero pair. I’d love to download your worksheets and foldable, but I don’t have a Scribd account. Do you have another method for sharing documents? This is such a great idea!! I will definitely use this at my tutoring session this evening 🙂 Thank you so much for sharing!